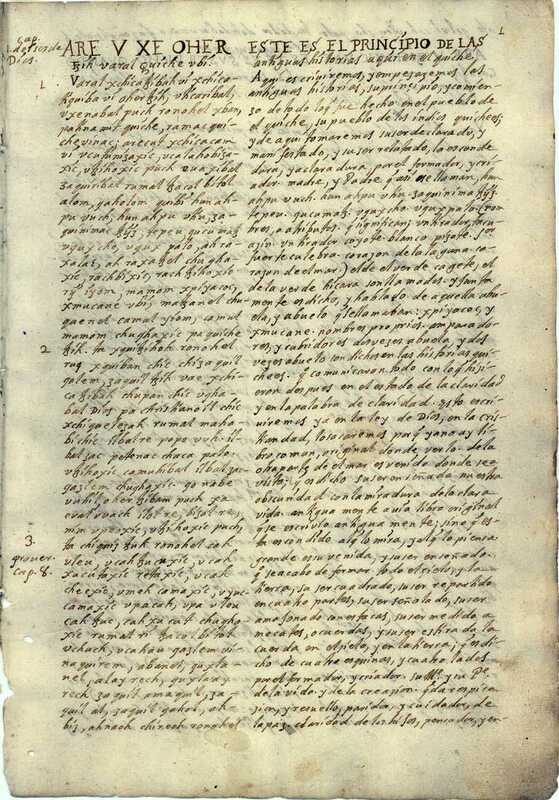 The first page of the Popol Vuh. The Popol Vuh is a sacred Maya text which narrates the Maya creation myths and describes the early Maya dynasties. Most of the Maya books were destroyed by zealous priests during the colonial era: the Popol Vuh survived by chance and the original is currently housed at the Newberry Library in Chicago. The Popol Vuh is considered sacred by modern Maya and is a priceless resource for understanding Maya religion, culture, and history. The Maya had a writing system before the arrival of the Spanish. Maya "books" or codices, consisted of a series of images which those trained to read them would weave into a story or narrative. The Maya also recorded dates and important events in their stone carvings and sculptures. At the time of the conquest, there were thousands of Maya codices in existence, but priests, fearing the influence of the Devil, burned most of them and today only a handful remain. The Maya, like other Mesoamerican cultures, adapted to the Spanish and soon mastered the written word. When Was the Popol Vuh Written? In the Quiché region of present-day Guatemala, around 1550, an unnamed Maya scribe wrote down his culture's creation myths. He wrote in the Quiché language using the modern Spanish alphabet. The book was treasured by the people of the town of Chichicastenango and it was hidden from the Spanish. In 1701 a Spanish priest named Francisco Ximénez gained the trust of the community. They allowed him to see the book and he dutifully copied it into a history he was writing around 1715. He copied the Quiché text and translated it into Spanish as he did so. The original has been lost (or possibly is being hidden by the Quiché to this day) but Father Ximenez' transcript has survived: it is in safe keeping in the Newberry Library in Chicago. The first part of the Popol Vuh deals with the Quiché Maya creation. Tepeu, God of the Skies and Gucamatz, God of the Seas, met to discuss how Earth would come into being: as they spoke, they agreed and created mountains, rivers, valleys and the rest of the Earth. They created animals, who could not praise the Gods as they could not speak their names. They then tried to create man. They made men of clay: this did not work as the clay was infirm. Men made of wood also failed: the wooden men became monkeys. At that point the narrative shifts to the hero twins, Hunahpú and Xbalanqué, who defeat Vucub Caquix (Seven Macaw), and his sons. The second part of the Popol Vuh begins with Hun-Hunahpú, father of the hero twins, and his brother, Vucub Hunahpú. They anger the lords of Xibalba, the Maya underworld, with their loud playing of the ceremonial ball game. They are tricked into coming into Xibalba and killed. Hun Hunahpú’s head, placed on a tree by his killers, spits into the hand of the maiden Xquic, who becomes pregnant with the hero twins, who are then born on Earth. Hunahpú and Xbalanqué grow into smart, crafty young men and one day find ball gear in their father’s home. They play, again angering the Gods below. Like their father and uncle, they go to Xibalba but manage to survive due to a series of clever tricks. They slay two lords of Xibalba before ascending into the sky as the sun and the moon. The third part of the Popol Vuh resumes the narrative of the early Gods creating the Cosmos and man. Having failed to make man from clay and wood, they tried making man from corn. This time it worked and four men were created: Balam-Quitzé (Jaguar Quitze), Balam-Acab (Jaguar Night), Mahucutah (Naught) and Iqui-Balam (wind Jaguar). A wife was also created for each of these first four men. They multiplied and founded the ruling houses of the Maya Quiché. The four first men also have some adventures of their own, including getting fire from the God Tohil. The final part of the Popol Vuh concludes the adventures of Jaguar Quitze, Jaguar Night, Naught and Wind Jaguar. When they die, three of their sons continue to establish the roots of Maya life. They journey to a land where a king gives them knowledge of the Popol Vuh as well as titles. The final part of the Popol Vuh describes the establishment of early dynasties by mythic figures such as Plumed Serpent, a shaman with godly powers: he could take on animal form as well as travel into the sky and down into the underworld. Other figures enlarged the Quiché domain by means of war. The Popol Vuh ends with a list of past members of great Quiché houses. The Popol Vuh is a priceless document in many ways. The Quiché Maya—a thriving culture located in north-central Guatemala—consider the Popol Vuh to be a holy book, a sort of Maya bible. To historians and ethnographers, the Popol Vuh offers unique insight into ancient Maya culture, shedding light on many aspects of Maya culture, including Maya astronomy, the ball game, concept of sacrifice, religion and much more. The Popol Vuh has also been used to help decipher Maya stone carvings at several important archaeological sites.